A perfect present for the coffee fanatic. 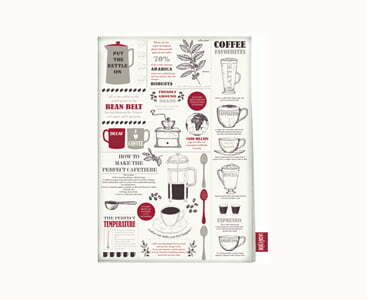 This quality design tea towel will tell you all you need to do to create a great cup of coffee whilst helping with the washing up. This La Cafetiere has an intricate design that is a must-have kitchen accessory for any coffee lover. Find charming facts and brewing tips in this artistic design. From the perfect way to make coffee with a cafetiere to a visual guide of various coffees, this towel covers the most popular coffee topics. The hand drawn illustrations will add a rustic feel to your kitchen or would also make a lovely gift for family or friends. The way most of us use tea towels is for drying, which is what they are designed for. However, there are so many other uses for them. Line a baking tray or basket to keep your baked goods warm, such as bread, cakes and pastries. Use as a hot pad to let dishes straight out of the oven to cool down without damaging your surfaces. Line your cabinet shelves to soak up the excess water from freshly washed dishes. This is especially handy for glass ware! Use for decoration. Add a creative element to your kitchen by choosing a stylish design or use as placemats on your dining table. Slightly dampen a tea towel and use flat under a chopping board to prevent slippages and accidents when cutting. This is also a great tip to stop mixing bowls moving around. Use a teapot cosy to add extra warmth or insulation. Which tea towels are best? From materials, textures, designs and patterns, there is plenty of choice when it comes to tea towels. But, what is best for the kitchen and which is the most useful? Firstly, it is always important to look at the material you are purchasing. A nice design can easily sway us in our decision making, but the absorbency is just important. It is a highly durable material with strong fibres that are resist against rips and tears. Cotton is easy to care for as it is machine washable. This means your tea towel won’t retain odours and you can keep it clean and hygienic, which is very important for the kitchen. It will retain its size and shape through many uses and washes. This Coffee Connoisseur is made from 100% high quality cotton. How do I wash my tea towels? As tea towels are used in the kitchen around food and for drying pots and pans, they will require frequent washing. Some materials, such as linen or low quality synthetic options can be difficult to wash without damaging or shrinking. Wash this tea towel at 40°c in a washing machine to keep it in excellent condition.